With new leadership in Washington, many investors believe that the economy is about to accelerate. Jim Cramer still wants them to be prepared in case that doesn't happen, and that means proper portfolio diversification. "Diversification means that when the market takes it on the chin, like we have seen over the past couple of days, you will still own something that is capable of hanging in there or even going higher," the "Mad Money" host said. Coca-Cola is the classic steady stock that tends to work, even when the economic environment is uncertain. Cramer spoke with Larry Williams to take a closer look at the stock and determine what the charts predict for the future. Williams is a technician who has traded futures, commodities and stocks for more than 50 years. He has written 11 books, and created various technical indicators used on Wall Street and teaches people to become better traders at IReallyTrade.com. Williams noticed some patterns in the charts for Coca-Cola that indicated to him that the stock could be headed higher from current levels. 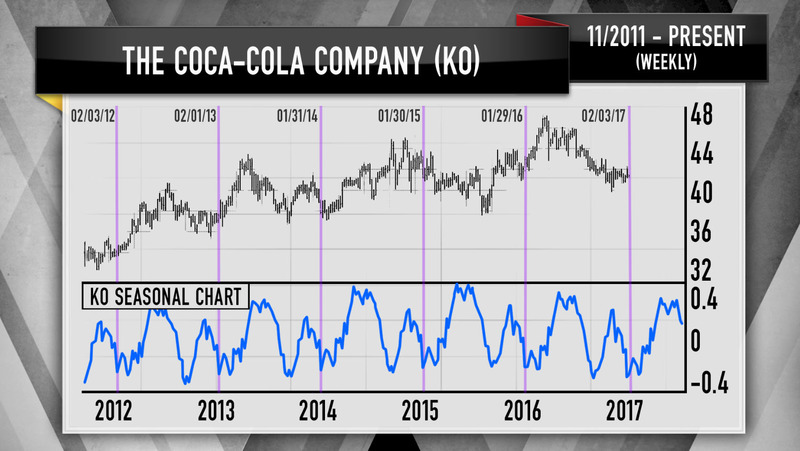 Looking at the weekly chart for the stock, Williams noticed that Coca-Cola tends to have two strong seasonal patterns in the year. It tends to start rallying in February, and then roar higher going into the fourth quarter. Williams believes that the seasonal factors are a good sign. The second pattern he spotted was the relationship between Coke and sugar. Typically any decline in the price of sugar flows to the bottom line of Coke. He used the daily chart to compare the prices between the two, and found a lead time of approximately 70 days between the action in sugar prices and when it impacts the stock of Coke. Given the action in sugar prices 70 days ago, Williams thinks Coca-Cola's stock could be due for a nice rally, assuming the pattern holds true. "If you believe that the Trump rally has truly gotten off track, than Coca-Cola is exactly the kind of stock you should be buying," Cramer said. For those that think the sell-off is simply a pause, Cramer advised to only own Coke for the purpose of diversification and additional income from its 3.36 percent yield. While Cramer remained a bit skeptical about Coca-Cola going higher, but if cyclical stocks will soon become red-hot again, he said it's still a high-quality company and investors could do worse than owning a stock like this one.